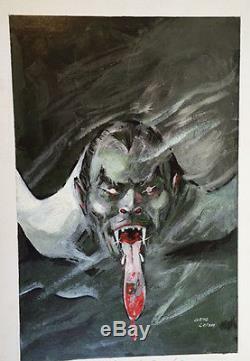 GENE COLAN ORIGINAL PAINTING - COVER ART - Tomb of Dracula - Signed. This is not a drawing, but an actual painting... Looks to be thick card stock matted onto a board.... Beautiful details when you look close up. Collector piece, never displayed, kept in EXCELLENT CONDITION. Slight dings on 2 of the corners.. 23 1/2 by 15 1/2 inches. Please note, written at the bottom it says, Thank you Dave for all that you have done for me. My personal wish is to help you as much - Gene. THIS CAN EASILY BE CROPPED OFF WHEN YOU FRAME THE PIECE... 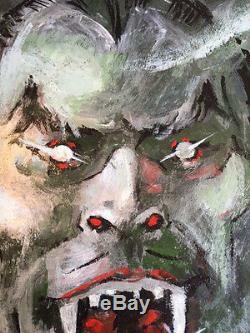 The item "GENE COLAN Original Painting Cover Art Tomb of Dracula, kirby, wrightson" is in sale since Thursday, July 21, 2016. This item is in the category "Collectibles\Comics\Bronze Age (1970-83)\Horror & Sci-Fi". The seller is "itconnectionnyc09" and is located in Astoria, New York. This item can be shipped to North, South, or Latin America, to all countries in Europe, to all countries in continental Asia, to Australia, ZA, to New Zealand.